Thank you from our Friends! On behalf of the Friends of the Abington Community Library, thank you for making our recent book sale a success! Whether you donated items, attended the sale and purchased items, or volunteered at the sale, we appreciate all YOU did to make this sale successful! 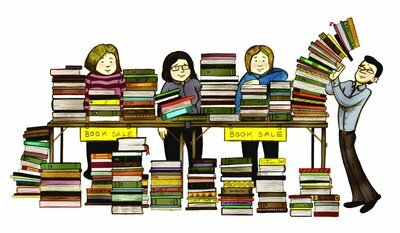 Mark your calendars for the Friends’ Fall Book Sale, Saturday October 5, from 8:30 am to 2:00 pm. You can support the Friends and the library all year long when you become a Friends’ member. Proceeds from book sales plus annual Friends’ dues have helped the Friends purchase items like Microsoft Surface Pros, toys and furniture in the children’s room, and locking DVD cases, plus sponsor library programs for all ages. Membership forms are available at the library, $10/individual and $15/family. Stop by today and become our new Friend!